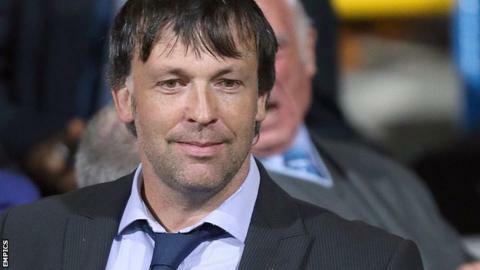 Blackpool chairman Karl Oyston plans to appoint a "domestic" manager following the dismissal of Jose Riga. Oyston sacked the Belgian on Monday after just 15 games in charge, with the Seasiders lying bottom of the Championship table on six points. Former Birmingham City boss Lee Clark has been strongly linked with the position at Bloomfield Road. "The next appointment will definitely be a domestic manager," Oyston told BBC Radio Lancashire. "You should never say never [on appointing a foreign manager] but I'd be extremely cautious and make sure I do a lot more research." "It [leaving] never crosses my mind and frankly the abuse comes and goes. I think it is normal in football and it doesn't affect me, not one bit." Asked if Clark, 42, would be the new manager, Oyston said: "I'm not going to confirm or even speak about that. "Once we've got an announcement to make and we've got a manager, then we'll obviously make the formal announcement." Riga, 57, had a 16-game spell in charge of Charlton at the end of last season before joining Blackpool in June. He had a fractious relationship with Oyston during his four months in charge of the Seasiders, with the pair clashing over the club's transfer policy. Blackpool started pre-season with just six first-team players and Riga questioned his chairman's commitment to bringing in further additions. Asked if he thought Riga had not been given enough money, Oyston responded: "I think that is rubbish and an easy, cheap shot. "When Jose arrived we had six players - we've now got mid-20. Every one of those players that we brought in was his choice. "The fact of the matter is we're not doing very well on the pitch and we're all equally unhappy about that." There have been protests by some supporters towards Oyston at the way the club has been run this season, but he insists he is committed to Blackpool. "It [leaving] never crosses my mind and frankly the abuse comes and goes," Oyston added. "It's no worse then when I first took over 16 years ago. "Look how far we've come on since then. I think it is normal in football and it doesn't affect me, not one bit."